Full colour posters are printed on the latest HPZ5200 8 colour inkjet printer using genuine Vivera inks which are fade resistant for up to 200 years. 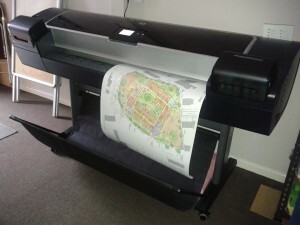 The printer can print up to 42 inches wide (1065mm) and up to 15m long. The printer uses 8 different ink colours to produce outstanding results on a variety of media, we hold some popular media in stock however if something unusual is required please allow a few days to obtain the paper required. We can print onto 90gsm bond, 170gsm matt or 190gsm glossy photo type paper, we can print A0, A1, A2 posters or other sizes on request to fit into large photo frames etc. We prefer receiving print requests as print ready PDF’s, we also accept Jpegs, TIF files or other picture files. We can trim the posters down to size if crop marks are supplied on our guillotine. We can laminate/encapsulate posters up to 600mm wide (A1 size) for added protection, see laminating page for further details. We can also print A4 and A3 posters on our Ricoh copier on various paper types, see photocopying page for further details.